10/9/03 ~ Monday is the day the guys are on TLC's A Makeover Story Check local listings. 10/01/03 ~ The Brand New Single from Emerson Drive is now out on Canadian Radio stations "Waitin' On Me" Check it out its a great song! if you not in Canada Check out CISNFM Which has a live link and they have been playing the song a ton. 9/13/03 ~ Emerson Drive has been added to Shania's new tour they will open on the Canadian dates she has out in Ontario No word yet on the dates out west here..Great thing for the guys! Congrats! 8/28/03 ~ Emerson Drive will be on TLC's Makeover Story on Monday October 13/03 at 10:30am Est. 8/16/03 ~ Check out CountryWeekly.com, vote for the guys in the fan voted Awards. You have until Aug 19 for the first round votes. or you could pick up a copy of Country weekly and do the mail in ballot. 8/13/03 Happy Birthday Mike !!!! Also Manager Gerry Leiske was nominated for "manager of the year" and Steven Goldman pick up a nod for Director of the year for the video "Only God". 7/23/03 ~ Happy Birthday David !!!!!! 7/21/03 ~ Happy Birthday Brad!!!!!!!! Emerson Drive will offer their makeover winner tips on his/her new look on "A Makeover Story" on TLC in August. Check your TV listings. 7/7/03 Also at the show we talked to Gerry and good news the Website is Coming Soon!!!!!!!!! 7/7/03- Thursday Night I had the Chance to see the guys again, WOW is all I gotta say.. The Show was AMAZING!!! Pictures and Review are coming in the next few days. 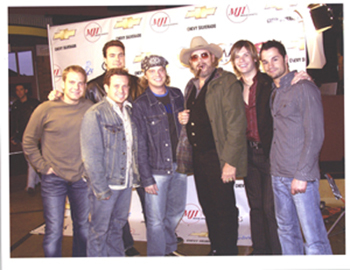 6/23/03- Check out Dreamworks Nashville they have added a bunch of pics of the guys from the Fan Club party. 6/16/03- Brad has sent a statement to the Fan Club Members regarding the decisions of Chris and Pat A to leave the Band. Assuring us that the guys were ok with there departure and remain friends. and not to worry that the rest of Emerson Drive will be around making music for as long as they can. 6/12/03- There have been several rumors running around various message boards about Pat Allingham leaving Emerson Drive. Pat has decided to leave the group and spend more time with his new family. While this is the sad news . The guys now have a new fiddle player named David. Who is already on the road with the guys. Welcome David!!!!!!!!!!!! 6/12/03- Did you catch the Grand Ole Opry on Saturday night?? Emerson Drive was on and did a wonderful Job they preformed "Fall Into Me" and "Only God". Then a bit later sat down for a quick interview. 5/22/03- Well they did it !! Emerson Drive is the 2003 ACM New Group of the year, Way to go guys it was much deserved. We knew you could do it. This is just the beginning of MANY Awards for you guys!!!!!!! 5/21/03- Well tonight's the Big Night !!!!!! the ACM Awards are being presented in Las Vegas...Lets all hope that Emerson Drive walks away with the new group award! 5/14/03- Check out the new interview with Brad at shrink wrapped.com plus a few pictures in the picture gallery. 5/02/03 Emerson Drive Fan Club Members Check your mailbox the invites for the 1st Annual Fan Club Party in Nashville have been sent out LOOK FOR THEM!!!! 4/21/03- If Your apart of the Emerson Drive fan Club and are going to this years fan fair make sure you go to the fan club party!!!!!! Details comming soon. 4/21/03- Look for the guys to appear on the Grand Old Opry on June7 (WAHOO can't wait for this ) this will be on the Televised part of the show. 4/8/03- The guys were at the 2nd annual Flameworthy Awards. I caught them on the red carpet pre show and they were looking FINE!! but *sinff* didn't win anything..
4/7/03- Well the guys didn't walk away with a Juno Award this year. They lost out to Shania Twain. 4/7/03 Check out the new issue of Country Weekly (April 15/03) There is a article on Emerson Drive with a few cute pictures. 3/28/03- A bit of Sad news to report Chris has decided to Leave Emerson Drive. This comes as a shock to many of us I'm sure. I wish Chris the best of luck in the future and We Will Miss YA!!! The guys do have a new keyboard player name Dale Wallace, from what I hear hes quite the accomplished keyboard player. I look forward to meeting Dale this summer! 3/25/03- Last Night CMT Canada Finally aired the new video "Only God". Its a great Video and I agree with alot of people this will be NUMBER One for the guys!!!! Plus the guys look good in the video as well! 3/23/03-EMERSON DRIVE: KEEP YOUR EYES ON YOUR AMPS! 3/18/03-For those of you lucky enough to be going to Fan Fair in Nashville this year Emerson Drive has been Confirmed that they will be there. Also they will be playing at the Celebrity of Hope baseball game !!!!!!! Emerson Drive's Brad Mates responded to the ACM announcements yesterday, "Two Top 5 singles out of the box, Billboard & R&R's Most-Played New Artists of 2002, the Juno nomination, and now the nomination for the ACM's Top New Vocal Group! We are so honored with the early acceptance and success of Emerson Drive and so excited to be part of the first-ever ACM show to take place in Las Vegas. Congratulations to Pinmonkey and Nickel Creek - see you in Vegas!" 3/04/03 The ACM Nominees were announced today and congrats to Emerson Drive for getting a nod in the Top New Vocal Duo/Group! The awards are Live From Las Vegas on May 21 live on CBS. 3/02/03- Just a quick thank you to My friends who were at the Coudersport Show. Tonight. I got the best birthday gift you could Imagine Danick called and wished me a happy birthday !!!!!!!! Thanks Girls and Thanks Danick that was sooo sweet! 3/02/03 Fall Into Me has been number 1 on CMT Canada for 2 Weeks now Congrats guys!!!!!! When we asked Emerson Drive who some of their influences were they first named Tim McGraw. "Tim McGraw is really a big influence on us," the group says. "When we started we started playing the bars a lot and started learning covers and stuff and what we tried to do was stay away from -- everybody plays the same covers in bars and not a lot of people played Tim McGraw so we did a lot of Tim McGraw stuff. And he's just so cool. He's got a unique voice, great production, great songs, awesome, and he's a really big influence on us." 2/20/03 WHY DID EMERSON DRIVE CHANGE THEIR ORIGINAL NAME FROM '12 GAUGE"
Emerson drive says, "The first name was 12 Gauge, that's how it first started out and it was funny because we had trench coats, we had cowboy hats, we had boots, we had big 12 Gauge buckles that took up half of our bellies. People loved it but -- yeah, we come from the most redneck part of Canada you can come from I think. "The Columbine High School shooting happened and we looked just like those guys without cowboy hats, you know. We had trench coats... So we got rid of that image quick. And also there was a rap group down in New York called 12 Gauge and they had sold a few records so we weren't messing with the boys down in the 'hood, so we left that alone and we moved on to Emerson Drive. And Emerson Drive comes from a road back home called Emerson Trail. 2/12/03- Over at the DreamWorks Nashville Site they have added new Multi Media Content to the Emerson Drive area.. Look for Clips of each of the guy while on the set of "Fall Into Me" and a Video montage of "Fall Into Me"
2/12/03 - Congrats to the guys who picked up a Nomination for the Juno Awards. They are in the best country recording category. They are up against Terri Clark, Shania Twian, Doc Walker, Michelle Wright. 2/12/03 If you are a member of the Dreamworks Dreamteam be sure to check out the phone call that a lucky Kay Culbertson got from Brad for being the top reporter Congrats KAY!!!!!!!!!! If your not a member of the dreamteam join today!!!!!!! 2/10/03 - The New Single from EMERSON DRIVE hits the airwaves on March 10 Look for it!!! 2/8/03 -The members of Emerson Drive have been singing a different song since moving to Nashville a few years ago from Alberta, Canada. However, the six-piece band had the unique opportunity to perform both "The Star-Spangled Banner" and the Canadian national anthem Wednesday night (Feb. 5). "We actually sing the American anthem more than we do the Canadian these days," lead vocalist Brad Mates tells CMT.com while the band traveled to Ohio to perform prior to what turned out to be the Columbus Blue Jackets' 4-4 draw against the Vancouver Canucks. "We only get back to Canada maybe once or twice a year, so 95 percent of our time is spent down here in the South," Mates says. "When we do the anthem, we usually do the American one, obviously, but it will be neat tonight." While Mates never took for granted the performances of either anthem, he says the songs have taken on an even greater significance. "Especially in this past year, there's been a lot of stuff that has gone on in the world," he says. "When you do get a chance to sing the anthem, it puts into perspective what we are here for and what we stand for. It does mean a lot." The trip to Columbus also provided some welcome entertainment for the Emerson Drive members. "We don't get to take in too many hockey games because we're so busy all the time," Mates says, "so it's kind of nice to sit down and watch a game." Emerson Drive return to Nashville this weekend to begin work on their new DreamWorks album -- and to make an appearance on CMT Most Wanted Live. The band's MWL appearance airs Saturday (Feb. 8) at 7 p.m. ET/PT. Emerson Drive's latest single, "Fall Into Me," remains solidly in the Top 10 of Billboard's Hot Country Singles & Tracks after no less than 32 weeks on the chart. The song's video has also widened the group's fan base. "We've always had fun making videos," Mates says. "I remember when we first did the video for [the debut single] 'I Should Be Sleeping.' It was a great introduction to Emerson Drive, just basically showing everybody what we're all about as six different people. I think 'Fall Into Me' has more of a story line to it. Once again, it gave us a chance to realize what video-making is all about. "For us, these last couple of years have been incredible, from shows to recording albums to making videos. It's all been an eye-opener for all of us. We just have to embrace it each day because you never know how long it's going to last." Any young musician could learn a lot about career longevity by spending time with songwriter-producer Richard Marx, who produced "Fall Into Me." Ironically, Mates had no idea he was destined to meet the '80s pop star when he bought a copy of Marx's Greatest Hits CD while visiting his parents in Canada. "A week later, we found out that he had listened to [an advance copy of] the Emerson Drive album," Mates notes. "We were passing through Chicago for the afternoon and he was wanting to meet us, just to hang out and get to know us. So we stopped in at his place, had lunch with him and listened to some music." With some record company executives present for the meeting, Marx and the band listened to several songs, including "Fall Into Me," written by Danny Orton and Jeremy Stover. "When Richard heard 'Fall Into Me,' he was just flipping out. He couldn't believe how great the song was. The funny thing was that the album was already finished. It was ready to go." Within two days, Marx was in the producer's chair when Emerson Drive recorded "Fall Into Me" and "How Lucky I Am," two tracks added at the last minute to their debut album. Marx will be producing Emerson Drive's next album, and the band is looking forward to the studio work. "Obviously, we're trying to outdo the first album," Mates says. "If we have that mindset, then for each album after this, we're hoping that things just keep growing." The band will be juggling their studio time with concert dates, but Mates says nobody is concerned about the hard work ahead. "We toured six years before we had a record deal," he explains. "When we got a record deal with DreamWorks, it didn't really faze us when they said, 'OK, you're gonna be out 300 days a year.' We were like, 'Wow, we've got another 20 extra days that we're not working this year.'" Emerson Drive Meets Hank Jr! 1/26/03 Emerson Drive Sighting!! Was shopping at the mall today and happen to see Mr Mates when I was Looking at CD's looked up and he was standing just over from me.. I was able to talk him with for a few minutes to bad every shopping trip wasn't like this one. 1/21/03 Fall Into Me is still doing great on the charts so the release of the new single "Only God" has been delayed a bit longer. But from what I hear the wait will be worth it. 1/21/03- Congrats to the guys for winning a Billboard Award for Top Country Artist Duo/Group for 2002.Plus the guys have also been nominated for an award at the Canadian Radio Music Awards these awards are given out during Canadian Music Week this February. Seeing Alabama come to a career turning point this week as they retire from the concert trail, reminded me of my first interview with them over 20 years ago. They were making their first visit to the West Coast to radio tour and meet some national media in support of their breakthrough single, "My Home's in Alabama." As they left our studio, I happened to catch them leaving town in their now famous green and white Dodge van pulling an equipment trailer. It was just the four of them, Randy driving, Teddy reading a road map spread out on the dashboard, Jeff and Mark in the back seat as they tried to find their way onto an L.A. freeway for a grueling, 2000 mile trip back home. Because of that experience the first time I saw country music's newest band sensation, EMERSON DRIVE, it was déjà vu all over again. In a video profile of the six guys, there they were riding in their 15-passenger van that had been their wheels for the last four years. It reminded me instantly of that first meeting with Alabama. When I told them about the comparison, they were pleased to know that a band as great as Alabama had started as humbly as they had. "It's kind of fun to hear about a legend band starting somewhat the same way we have," they said. "It's a good feeling to know we're not the only ones!" 1/8/03 An interview that Emerson Drive taped with Rob Simbeck for ABC Radio Network's "American Country Countdown" will air on the countdown show every other weekend in January, 2003. A new Emerson Drive video shoot recently wrapped up in Houston. The video for "Only God" was shot on December 9th and 10th. Richard Marx has been working in the studio with Emerson Drive The guys are in the studio working on their new album. 1/1/03- With all the year end countdowns I know that the guys would have placed on the charts I am please to report that here in Edmonton the guys had both I Should Be Sleeping and Fall Into Me on the CISN top 103 of 2002 Fall Into Me was # 35 and I Should Be Sleeping was # 8.. Way To GO Guys!!!!! if anybody want to email me with where the guys ended up in their area I will post it here to..
1/1/03 HAPPY NEW YEAR to everybody hope you had a safe one! 12/24/02 Just wanted to take this opportunity to wish everybody a very MERRY CHRISTMAS & HAPPY NEW YEAR!!! 12/24/02- A very nice Christmas gift in my mail this morning If you are apart of the Emerson Drive fan club you got a Christmas card from the guys which they did personally sign and Jeff had also singed it was well! THANKS GUYS!!!!! EMERSON DRIVE - Brad Mates (lead vocals) - "The Christmas holidays are my favorite time of year because I get to spend time with my family and friends, they are the most important thing in my life. Having a great support foundation is more special than any present at Christmas!" Chris Hartman (keyboards) - "I plan on visiting with my family as much as I can, especially since I haven't seen them in over a year. I hope to do a little skiing in the mountains and drink as many of my mother's Christmas slushies as possible!" Danick Dupelle (guitar) - "I'll get together with all of my family and enjoy some home cooked turkey, stuffing and mashed potatoes! I'm planning on getting together with my friends back home and watching a few movies, especially 'The Lord of the Rings.' The holidays are a time for me to relax and get ready for the New Year; I'm looking forward to being busy again!" Mike Melancon (drums) - "I'm going to spend some time with my Mom, Dad and sister because I haven't been home to see them in about 9 months. I'm also going to eat a lot of food, catch up on my sleep and relax! I'm looking forward to spending some time on the ski slopes snowboarding too!" Pat Allingham (fiddle) - "I plan on visiting my family and relaxing. I may even go over to Vancouver Island for a week and visit my best friend who I haven't seen in a year. Hopefully I'll be able to do some fishing and I also plan on drinking lots of spiced rum and eggnog!" Patrick Bourque (bass) - "The greatest thing about Christmas is that I get to see all of my relatives and friends. Hopefully I'll be able to go skiing and snowboarding too!" 12/15/02- Chris has posted the letter of the week for the guys Check out http://emersondrive.dreamworksnashville.com/ to read it..
12/03/02-ED's Single "Fall Into Me" goes Top 10!! Emerson Drive's second single, "Fall Into Me", moved into the Top 10 last week on country radio's R&R & Billboard charts and keeps moving up this week (#9 in R&R and #8 BDS)! This is the guys' second Top 10 single - CONGRATULATIONS!!! 11/27/02 - Last night the guys played a hometown show in Grande Prairie Alberta from all accounts the show was great and the guys were super happy to be at home to do a show after several months on the road. 11/26/02- Check out the Dreamworks Website area for Emerson Drive each week one of the guys will leave a quick little letter on what's going on with them Brad & Danick have posted letters in the past weeks of so check it out here..
11/24/02-Grey Cup was today in Edmonton and we had such a great time check out the photo area and concert review for all the details of what happened. 11/20/02 The guys will be on 2 upcoming radio shows The "Lia Knight Show" on December 10th. Emerson Drive will be calling in plus calling in on "All Nite with Danny Wright" on December 10th as well. 11/19/02- Sometimes late November, early December CMT and MWL will be showing a segment with the guys in the studio with Richard Marx. 10/18/02 -Great News for all us Emerson Drive Fans the guys will be at Grey Cup this year (Canada's version of Super Bowl) Held in Edmonton. They will be heading up the pregame festivities. Not sure if they will be shown on television, The game will be on CBC in Canada and I don't know if and which Channel in the US. 10/20/02- HAPPY BIRTHDAY to Jeff Loberg!